Light, minimalistic and almost transparent design is a modern trend and a jewelry online store canâ€™t ignore the fashion if he wants to become profitable. This OpenCart template combines the sophisticated look and simple structure to make the visitor feel himself in the luxury place. Calm and pastel color scheme has a light smell of vintage and it is also very popular now. The fonts are accurate and fit the general design, the photo tiles are placed on the positions that highlight the beauty of products. As in every OpenCart template, the product cards are understandably organized and can be previewed, compared and added to the shopping cart or wishlist. Parallax is a scrolling technique in which foreground photo files move in a different tempo than the background ones. Computer animation effects make the internet site more compelling and also engaging. Parallax is some sort of modern-day trend, for that reason having it at your own web page not simply causes it to be more eye-catching but also better looking. This is the ability of the layout to transform according to the width of the display. Smartphones drive 80percentage of worldwide web usage. It's important to create the website page responsive if you don't desire to lose your current customers. Bootstrap is an open-source framework for producing web sites. Bootstrap lets you construct responsive, mobile-first web-based projects in an easy way. What are the advantages of purchasing a Fashion & Beauty News OpenCart design? The major advantage of purchasing a Fashion & Beauty News OpenCart design is price: You get a high quality design for just $20-$70. You don't have to hire a web designer or web design studio. Second advantage is time frame: It usually takes 5-15 days for a good designer to produce a web page of such quality. 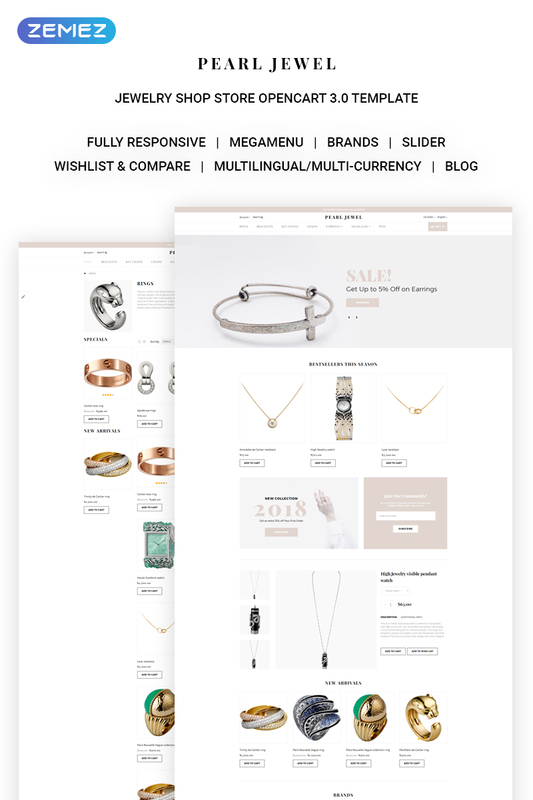 Is it possible that Template Monster will contact my client which website I made from Template Monster's website OpenCart ecommerce template for Jewelry Catalog ? Yes, our legal department checks licenses regularly. In case we won't find designer's contact information on the site which was made from the OpenCart ecommerce template for Jewelry Catalog of ours we will contact the owner of the site directly. Are there any limitations on selling the OpenCart ecommerce template for Childrens Fashion as the integral part of my new product? Can I put a line at the bottom ( or any other spot) of the customized OpenCart design for Fashion & Beauty Store "Website design by Company name"? No, you cannot place a line at the bottom ( or any other spot) of the customized OpenCart design for Fashion & Beauty Store saying "Website design by Company name". Nevertheless, you can place "Customized by Company name". Will TemplateMonster help me to edit my OpenCart template for Jewelry Gifts ? TemplateMonster offers you a variety of sources to help you with your OpenCart template for Jewelry Gifts . Use our comprehensive Online Help Center to get the basic knowledge about your OpenCart template for Jewelry Gifts . Our Knowledgebase contains customers questions and most frequent problems. Anyway, you can always use TemplateMonster 24/7 phone support, try our Ticket System or Live Support Chat to get qualified assistance from our support representatives. Can I customize the OpenCart design theme for Urban Fashion? Yes, you can customize the OpenCart design theme for Urban Fashion to any extent needed. You cannot use a header of the template for one project though, and images from the template for the other project. How can I modify Fashion Stylist OpenCart theme to suit my particular website? Please visit our Online Help Center to obtain detailed instructions on editing Fashion Stylist OpenCart theme. What is a one time usage license for a OpenCart template for Fashion Magazine? When you buy the OpenCart template for Fashion Magazine at usual price you automatically get the one time usage license. It enables you to use each individual product on a single website only, belonging to either you or your client. You have to purchase the same template again if you plan to use the same design in connection with another or other projects. When passing files to your client please delete the template files from your computer. I have customized the OpenCart ecommerce template for Fashion & Beauty News and would like to protect my content by copyright, can I place Copyright, Mycompanyname.com? After OpenCart ecommerce template for Fashion & Beauty News purchase you can put your copyright to the template. But you cannot place a line at the bottom (or any other spot) of the customized project saying "Website design by Company name". Nevertheless, you can place "Customized by Company name". Do you provide any scripts with your OpenCart design themes for Fashion Lookbook or could you do some custom programming? Our templates do not include any additional scripts. Newsletter subscriptions, search fields, forums, image galleries (in HTML versions of Flash products) are inactive. Basic scripts can be easily added to a OpenCart template for Couture Fashion at www.TemplateTuning.com If you are not sure that the element you're interested in is active please contact our Support Chat for clarification. What is the difference between unique and non-unique OpenCart ecommerce theme for Jewelry Supplies purchase? Non-unique purchase:Non-exclusive purchase means that other people can buy the OpenCart ecommerce theme for Jewelry Supplies you have chosen some time later. Unique purchase:Exclusive purchase guarantees that you are the last person to buy this template. After an exclusive purchase occurs the template is being permanently removed from the sales directory and will never be available to other customers again. Only you and people who bought the template before you will own it. Can I integrate the OpenCart design theme for Urban Fashion with third-party software or applications for development of my new products? No, you cannot get the developers license for development of OpenCart design theme for Urban Fashion or other products. Can I get the extended license for some other pricing than the half of the initial OpenCart theme for Streetwear Fashion price? No. The price for purchasing license for a single OpenCart theme for Streetwear Fashion is the half of the template unique price. Can I put a line at the bottom (or any other spot) of my new product "Website development by Company name" after purchasing OpenCart template for Fashion Stylist? Yes, you can place a note at the bottom (or any other spot) of my product "Website development by Company name". Nevertheless, you cannot place "Website design by Company name" while using one of OpenCart template for Fashion Stylist. What will I see instead of the images after installation of the OpenCart theme for Fashion & Beauty? After OpenCart theme for Fashion & Beauty installation you will see blurred images included for demo purposes only. Can I resell the customized OpenCart theme for Beauty Blog? No, you cannot resell the customized OpenCart theme for Beauty Blog as a template but you may sell it as a project to your client (see paragraph 1 ONE TIME USAGE LICENSE for more details). Can I use graphics from OpenCart ecommerce theme for Fashion Looks I purchased for use in printing? 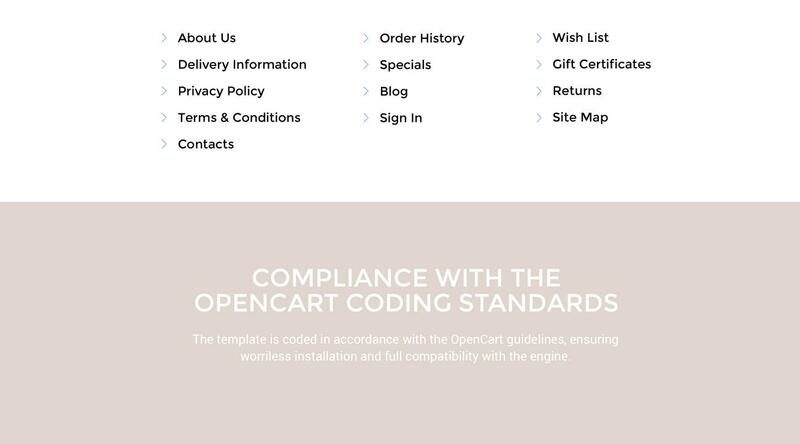 Yes, it's not prohibited to use the OpenCart ecommerce theme for Fashion Looks graphics for printed material, but the resolution of the templates graphics ( except for logo templates) is not enough for printing. Is it possible to reactivate my download link for OpenCart ecommerce template for Childrens Fashion if it was deactivated after 3 days? Yes. Please re-activate the download link for OpenCart ecommerce template for Childrens Fashion within your account under the Downloads tab or contact our billing department directly regarding that. Make sure that these charges for OpenCart design theme for Jewelry Repair have different order IDs. If it is so, contact our billing department. Can I resell the OpenCart themes for Jewelry I bought the extended license for? No, you cannot resell the OpenCart themes for Jewelry as is. You can only sell them as the integral part of your new product. Can I get the OpenCart ecommerce template for Online Fashion in higher resolution to use for printing? No, we design OpenCart design themes for Baby Fashion optimized for web resolution only. I ordered a OpenCart ecommerce template for Jewelry Designer but haven't received the download information. In case of not receiving the download information of a OpenCart ecommerce template for Jewelry Designer , please contact our Billing Department via support chat by phone or e-mail. How many applications, programs etc can I use to integrate with the OpenCart designs for Womens Fashion under one extended license? The extended license gives you the right to use the purchased OpenCart designs for Womens Fashion for the integration with one software/freeware/application/CMS/sitebuilder only. In case you would like to use the template with the other application, the other license is to be acquired. What is a buyout purchase license for OpenCart design for Fashion Magazine? If you purchase the product at a 'Buyout price' it guarantees that you are the last person to buy this template from us. It means that this OpenCart design for Fashion Magazine may have been sold before a couple of times (see 'Downloads' number in item's properties) but only you and people who bought the template before you will own it. After this kind of purchase the template is being permanently removed from our sales directory and is never available to other customers again. The buyout purchase license allows you to develop the unlimited number of projects based on this template, but the template should be customized differently for every project. state of the art Template Monster did an amazing job and we wholeheartedly recommend them to any company who wish to develop a cutting-edge web site at a reasonable price. The template is just what we are looking for. The web site interface is so brilliant and its function is powerful. Their customer support team is also very dedicated and professional, they helped solve most technical issues we encounter in a timely manner. Thank you so much!